Last week an op-ed titled "Is South Korea’s Alliance with the United States Worth It?" by Se-woong Koo, best known for running Korea Expose, appeared in the New York Times. As a piece meant to educate American readers about negative effects the alliance has had on Koreans, it succeeds, but at the cost of being rather one-sided. On the one hand, well, yes, it's an op-ed, and op-eds tend to lean in one direction over another. As well, there's often not a lot of space, so it's not difficult for nuance to get lost. And more material could have been excised by an editor. Still, it seems to play the victimization note a little too consistently to suggest that wasn't the intent. The introduction based around a personal anecdote is an effective and interesting beginning. It is noted that "South Korea’s relationship with the United States started as one of dependency," which is a good point - though more important might be the fact that a large number of educated people then, and still, feel ashamed by this. For millennia, societies the world over have adopted aspects of the culture or social organization of more powerful states they hoped to influence, but Koreans - North and South - have turned the Korean term describing this - Sadaejuui - into an epithet, which reflects both shame at dependency as well as a desire to overcome that shame. In fact, the thesis of the article - "when that partner turns ungrateful, and even unreliable, it is time to question the idea that the alliance is sacrosanct" - is not a new one. One only need look at the rhetoric critical of the US in the Korean news media during the 1988 Olympics, couched as it was in the need to "recover wounded national pride," to see anger lashed out at an "ungrateful" or "disrespectful" guest. Such criticism of the "erosion of South Korea’s sovereign spirit" had been alive and well for decades, at least in some circles. 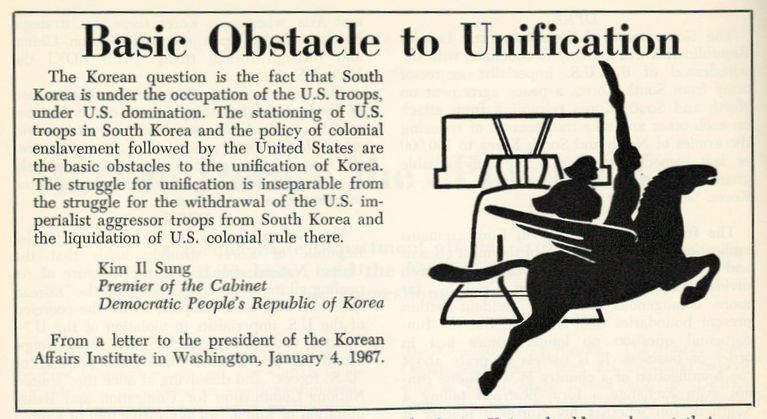 Reading news reports from the 1950s and 1960s makes clear that more than a few Koreans have long chafed at the US military presence here, and frustration has boiled over periodically throughout the entire length of the alliance (as well as due to the presence of Americans here generally, for example during the Haysmer apple incident in 1926). 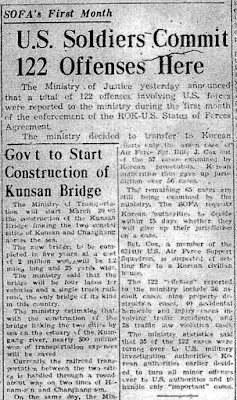 Mention is also made of Korea being compelled to contribute soldiers to America’s wars, but all we read of are 5,000 Korean dead and Agent Orange exposure, making it sound like an unmitigated loss for Koreans rather than the huge shot in the arm it was to Korea's economy (right down to the village level due to soldiers sending money home). Much as the Korean War had provided Japan with an opportunity for economic recovery after the destruction of the Pacific War, the Vietnam War (and the normalization of relations with Japan) provided Korea with a means to develop its economy. Withdrawal of US troops might sound like a good idea in theory. In practice, I'm not so sure. Then there is the Status of Forces Agreement, signed between the two nations in 1966 and renewed twice. It has been understood to grant the United States military nearly exclusive jurisdiction over its personnel, such that even high-profile offenses committed by American soldiers against South Korean citizens go unpunished. One of the most heinous examples happened in 2002 when an American military vehicle ran over two middle-school students, crushing them to death. The perpetrators were shielded from South Korean authorities and a United States military court dismissed the case. The "It has been understood" part is rather weaselly, in that this perception by the Korean people, encouraged by citizens groups and the media, is mostly incorrect (especially since 1988 and even more so since the 2000s). In not saying so, however, it conveys to American readers that this one-sided "understanding" is factual. 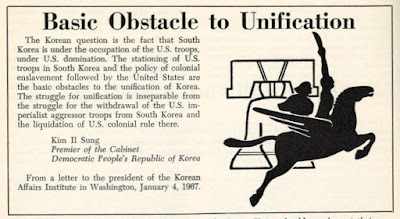 The idea that the "United States military [has] nearly exclusive jurisdiction over its personnel, such that even high-profile offenses committed by American soldiers against South Korean citizens go unpunished" better applies the pre-SOFA days (or perhaps to its first 20 years) rather than the present. The 122 "offenses" reported to the ministry include 36 assault cases, 40 accidental homicide and injury cases involving traffic accidents, and 28 traffic law violation cases. The ministry statistics said that 35 of the 122 cases were turned over to U.S. military investigation authorities. Korean authorities earlier decided to turn all minor offenses over to U.S. authorities and to handle only "important" cases. 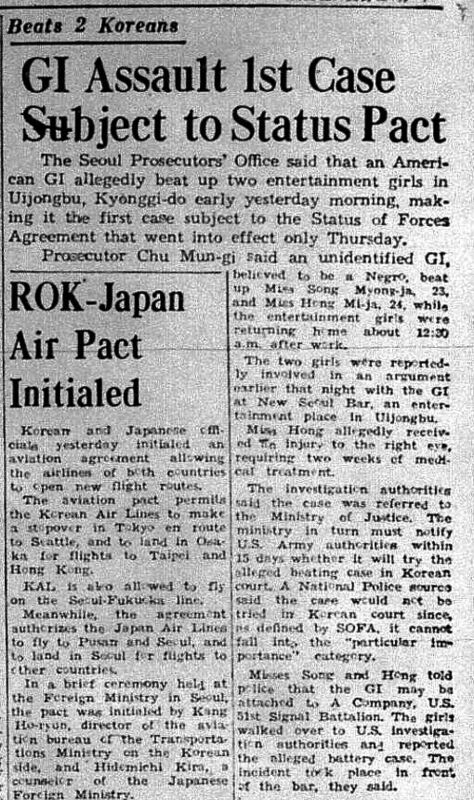 The first soldier to be indicted by Korean prosecutors was Billy Cox, who was charged on March 29, 1967, as this June 20 article relates. While the U.S. ROK Status of Forces Agreement gives South Korea primary jurisdiction in incidents involving American troops outside U.S. bases, [Seoul Prosecutor] Yoo [Sang-su] said authorities "have waived that jurisdiction in the past." "The national consciousness toward American troops in Korea has changed, however, and it is time we begin exercising a wider scale of jurisdiction," he said. 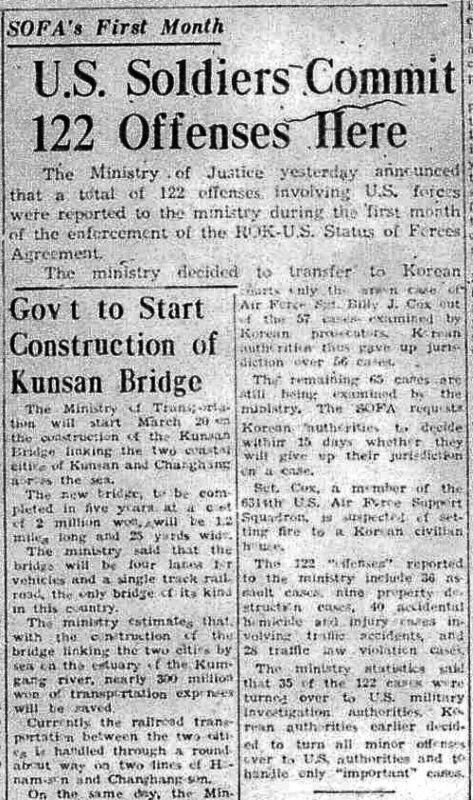 Needless to say, the idea that off duty American soldiers were out of reach of Korean authorities is an exaggeration, to say the least, and the post-1988 "exercising [of] a wider scale of jurisdiction" was directly tied to attempts to recover national pride and a change in "national consciousness" after the Olympics. As for the use of the word "heinous" to describe the 2002 traffic accident - a word with synonyms like "odious, wicked, evil, atrocious, monstrous, abominable, detestable, contemptible, reprehensible, despicable" - this makes rather clear the bias of the author, since it gives the impression that there was malice aforethought in the running over of the two girls, when accounts by those who were there make clear it was an accident. A narrative of Korean victimization at the hands of unpunishable Americans - the standard SOFA narrative since 1988 - drove thousands into the streets for the first, avowedly "non-political," candlelight protests, which have been a means for expression of the national will ever since. [T]he judge told me he would give me a self defense sentence which was typically 2+ years… even though I was convicted of attempted murder. Basically the conviction was to appease the people of S. Korea, and the sentence was relative to a "self defense with a deadly weapon" conviction in that country. The judge was truly fair to both parties in that aspect. His sentence gives hope that judges have the ability to fairly deal with biased prosecutions. Needless to say, there's a lot complexity involved in the SOFA issue, far from the black and white way in which it is often portrayed. Such simplistic formulations involving victimized Koreans obscure more than they illuminate, and do a disservice to one's readers. 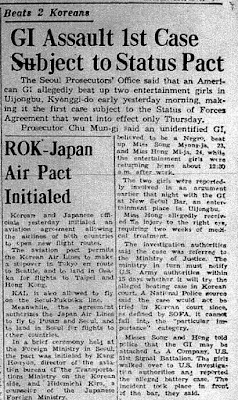 Above I made mention of how a narrative of Korean victimization at the hands of unpunishable Americans has been the standard SOFA narrative since 1988. I've translated a key article from that time and posted it here. "Why can't Americans be Punished?"